Welcome to Part 2 of my series on reducing chronic lower back pain. If you haven’t read part 1 yet make sure to become familiar with the fundamental postures for reducing lower back pain in part 1 before beginning part 2. 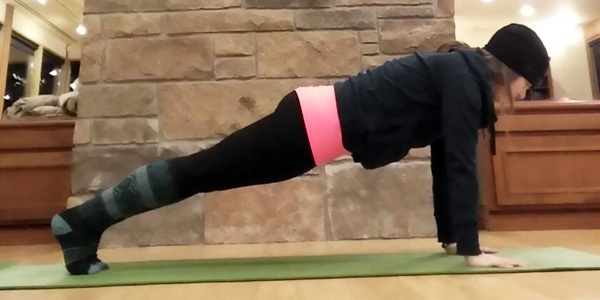 Part 2 focuses on strengthening the core and lower back to build stability and reduce pain. 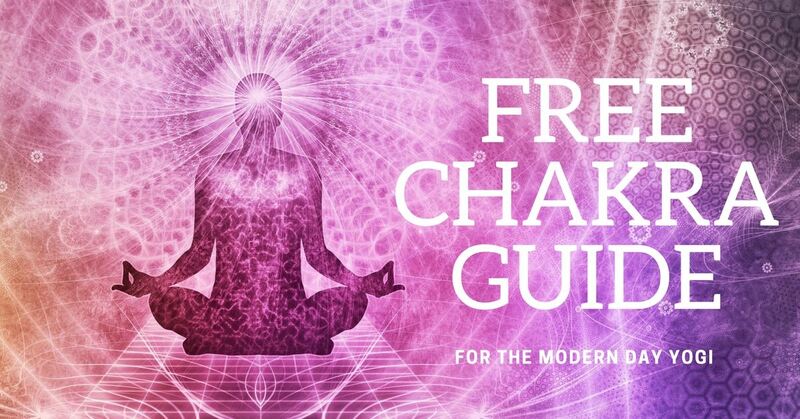 If you’ve read and practiced the first part of this series you’re probably ready to add in a couple more strengthening poses. Strengthening the muscles of the lower back and abdomen help give stability to the lumbar spine and pelvis and can reduce chronic lower back pain. It is important to remember to start small and add in only one or two more postures to your low pack pain program at a time. Remember to consult your doctor or physical therapist before beginning a new exercise program. Begin by warming up the lower back with 5-10 rounds of Cakravakasana. Not sure what Cakravakasana is? Here is a link to the previous article that describes how to perform Cakravakasana. Start by adding one or two of these postures at a time to your routine for lower back pain. Continue to add postures as you begin to build strength. Remember to take your time. It’s not a competition. It is important to take rest between exercises and give your lower back a gentle stretch. Excellent postures to release tension in your lower back between rounds are Apanasana (Supine Knees to Chest), Cat-Cow, Cakravakasana, standing while moving the hips in circles, and Childs Pose. Exhale into this pose as you draw your navel to spine, round your back and connect knee to elbow. Inhale, engage your core and extend your leg back behind you. Take a breath and then extend your opposite arm out in front with your next inhale. Benefits: Strengthens and tones the core and lower back, improves balance, creates stability in the pelvis and improves coordination. 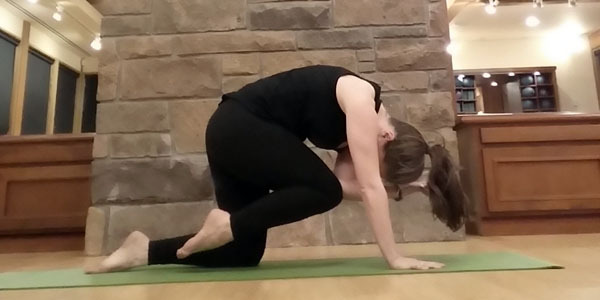 Instructions: Make your way into Table Top pose (hands and knees) with hands directly under your shoulders and knees directly under your hips. Spread your fingers wide. If your knees are sensitive then place a folded blanket under your knees. To begin, extend your right leg straight behind you with your leg parallel to the floor and foot flexed. Make sure your right hip isn’t lifting up higher than your left hip; hips are “square” to the floor. And make sure that you aren’t collapsing into your left hip (we don’t want the hip jutting out to the side). You may choose to hold here for three to five breaths and then switch sides. If this exercise feels stable extend your opposite arm straight forward with your thumb pointing up toward the ceiling. You may choose to hold here and create a long, diagonal line of energy for 3-5 breaths. If you want more of a challenge you create a “crunching motion” by drawing the knee of your extended leg and the elbow of your opposite extended arm toward one another underneath your torso, while rounding your back. Hold for a moment or two and then extend long. Repeat 5 times on each side. Inhale as you rotate your pelvis to lift hips, belly and heart. Bridge Pose set up. Exhale as you return to this pose. Benefits: Bridge Pose stretches and strengthens the back and can alleviate low back pain, opens chest and hip flexors, strengthens core muscles and improves the flexibility of the spine and hips. Instructions: Lie on your back, bend your knees and walk your feet in as close to your hips as is comfortable for your body, knees are hips width distance and feet are parallel to one another. Stretch your arms down by your hips, palms face down. On an inhale breath begin to curl your tailbone up toward the sky, lifting your pelvis up and gently peel your spine away from the floor to lift the belly and chest. Keep your gaze straight up at the ceiling to protect your neck. As you exhale, gently begin to roll down beginning at your upper back and ending when your tailbone reaches the ground. Repeat 5-10 times. As you begin to build strength begin to increase the length of time you spend in the posture, eventually holding for 15+ seconds each round. Plank Pose strengthens the entire core, shoulders and legs. 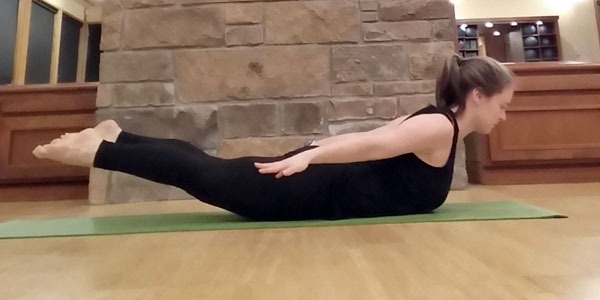 Benefits: Plank pose is a beneficial strength builder for the entire body, in particular the muscles of our abdomen, lower back, legs, hips and shoulders. Instructions: To come into Plank Pose begin in a Table Top Pose with shoulders stacked right over your wrists and then step back with one foot and then the other, so both legs are extended long and you have one long line from crown of your head to your heels. If you find Full Plank Pose too challenging for you today bring your knees down to your mat and create a long line from knees out through the crown of your head. Make sure your shoulders are over your wrists and fingers are spread wide. Imagine pressing your hands strongly into the earth beneath you and forward without actually moving them. Draw your navel back toward your spine and make sure you’re not collapsing in your lower back or sticking your booty up in the air. Press back through your heels to activate your legs fully. Begin by holding for 20 seconds and progressively work your way up to 1, 3 or even 5 minutes. Keep a slow and steady breath and know that you may exit the posture at any time. Inhale lift your chest, legs and hands. Hold in the lifted position for a couple of breaths and use an exhale to lower down. Benefits: Locust pose strengthens and tones the muscles of the entire back, glutes and hamstrings and massages the abdominal organs. Instructions: To find Locust Pose begin by lying on your belly with your left ear down, hands back by your hips with palms facing up and toes touching and heels falling out to the side. Allow your body to rest here and take a few deep centering breaths. When you’re ready guide your forehead or chin to center (whichever feels best on your neck), flip your palms down and take your feet hips width distance. On an inhale begin to lift your chest and head up off of the ground. To move deeper lift your legs off the ground. If you’d like a bit more of a challenge lift your hands off the ground as well. Make sure to find a long line of energy from the crown of your head out through your pointed toes. Begin by holding for 15 seconds and then return to the rest pose that we began in with your opposite ear down. Repeat 4-8 times. Once this exercise becomes easier you can increase the length of time held in the posture to 30 seconds each set. Supine hip lifts. Only lift hips 1/2 an inch using the strength of your core and no momentum. 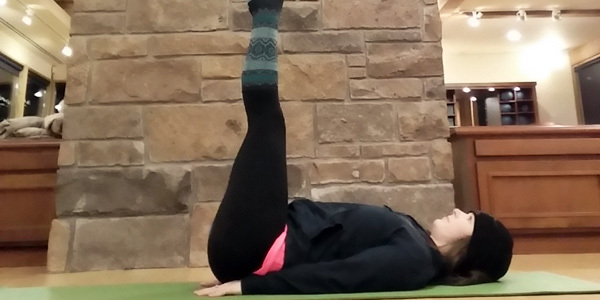 Benefits: Supine Hip Lifts strengthen your lower abdominals to improve core stability. Instructions: Lie on your back. Stretch your hands down toward your hips with palms facing down. Gently rock your hips a little side to side to slide the edges of your forearms underneath the outer edges of your hips. This will help you press your lower back into the mat. Extend your legs straight up to the ceiling. Keep your legs straight as you lift your hips off of the ground only a half inch, no more, and release back down. Repeat 10 times. Make sure you are using the strength of your core and not momentum. Think stable and controlled with no extra movement. Begin with performing 3 sets of 10 and gradually increase. As you come into this posture imagine that your legs, hips and shoulders are all against a wall. 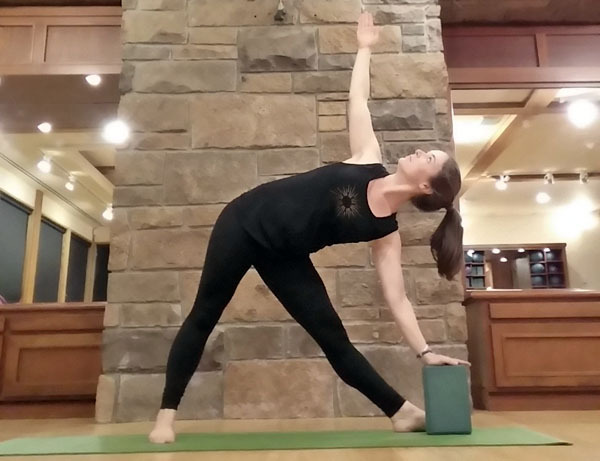 Benefits: Triangle Pose strengthens the legs, stretches the hamstrings and lower back, improves mobility of the spine and pelvis, and helps build core strength. Instructions: Stand in the middle of your mat facing the long edge, then step your feet wide apart. With your arms extended straight out to the side from your shoulders your wrists should be right above your ankles. Rotate your right foot 90 degrees, so it points straight forward to the short edge of your mat and rotate the toes of your left foot in slightly and draw the heel of your left foot slightly toward the back edge of your mat. Keep your legs straight throughout this exercise with quadriceps engaged and big toe of your front foot grounding down into the mat. Begin to slide your left hip back, tuck your right hip under the left as you stretch your torso horizontally toward the front of your mat. Once you’ve stretched forward as far as you can go, then rotate your arms, bringing your right hand to a chair, block, shin, or floor and extending your left arm up toward the ceiling. Your chest should be perpendicular to the floor (think of rotating your heart up toward the ceiling instead of down to the floor). Your gaze can be down at the floor, straight ahead or up at the ceiling. Hold the posture for 3-5 breaths and then exit the pose by grounding down through your feet and engaging your core. Repeat on the other side. You may choose to practice this posture 1-5 times per strength building session. Remember to slowly and gently challenge yourself. I hope you’re feeling like you’re well on your way to reducing your lower back pain and gaining confidence in your practice. As always, feel free to contact me with questions. Check back soon to try out Part 3: Restorative Yoga Postures for Lower Back Pain. Please note that Autumn Adams is a 500+ hr yoga instructor and has studied extensively with her teachers, but she is not a doctor. She asks that you please consult your doctor or physical therapist before beginning any new exercise program.